With the rapidly changing market, many companies are adopting DevOps processes to keep up with shrinking release cycles. With this change, old software security methodologies such as dynamic testing and pen testing are struggling to keep up. This doesn't mean that we don't need dynamic testing, rather that companies are searching out solutions that can keep pace with modern DevOps processes. IAST is the only dynamic solution that fits the speed of DevOps. It is fast and continuous, finding vulnerabilities in runtime environments. But IAST is only one part of the software security puzzle. For full coverage, from SDLC integration to runtime environments, you need synergy between your solutions. Checkmarx offers a synergy with between IAST and SAST that cannot be achieved elsewhere. The two solutions working together improve the quality of results and allow easier and more precise prioritization, leading to easier and shorter remediation. 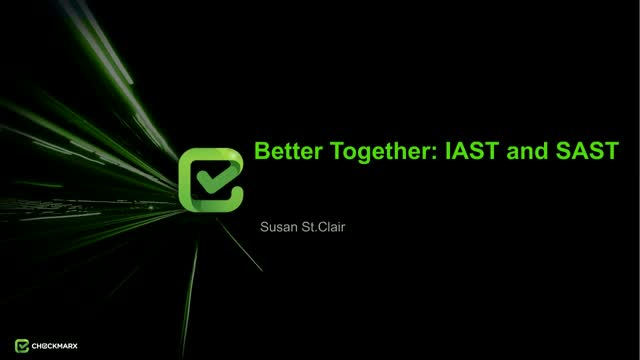 Join Susan St. Clair, Technical Services Engineer at Checkmarx, to get a better understanding on why IAST and SAST are better together. Artificial Intelligence (AI) software is everywhere being leveraged by many industries such as healthcare, fintech, and e-commerce. But how does AI impact the security space? Join Maty Siman, Checkmarx Founder and CTO, to get both a white hat and black hat perspective to AI and security. Data breaches continuing to make the headlines and enterprises are no longer questioning "if" a breach will occur, but "when." With the organization's data assets and reputation at stake, having a breach response plan in place is becoming increasingly important. - How to keep your company secure in 2019"
Junte-se a Tiago enquanto ele compartilha com você dicas e boas práticas sobre como implementar com sucesso medidas de segurança em um ambiente DevOps, desde a primeira linha de Código até uma aplicação funcionando ao vivo. This webinar is based on the lessons learned from many hundreds of secure development software deployments within various enterprises. Join us for this Checkmarx expert briefing to understand what works and what doesn't when it comes to rolling out Secure Development Education - at scale - as an important component of your Application Security Program. During this session, Matthew Rose will discuss what is software exposure, what is driving the need to manage it and will present the benefits of embracing it. Matthew will also discuss why a platform-based approach is an increasingly attractive option for enterprises, who should be responsible for threat identification and vulnerability remediation within DevOps, what’s the best way to provide training on software security and why AppSec is dead. Enterprises are moving beyond the traditional development model to incorporate software security from the beginning, instead of as the final step before the code is compiled or the product is released. DevSecOps (sometimes referred to as SecDevOps) aims to integrate security testing into DevOps to produce secure applications without impacting time-to-market. Join this interactive panel of industry experts as they discuss the key factors for DevSecOps success. Unify your application security into a single platform and release secure software, fast.